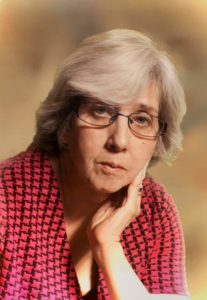 Dana Beth Neale, 57, of Mason City, passed away March 26, 2019 at St. John’s Hospital. Visitation will be Sunday, March 31, 2019 from 2-3 PM at Park Meadows Baptist Church. Funeral services will follow at 3 PM also at the church. Cremation rites will then be accorded. There will be no burial at this time. 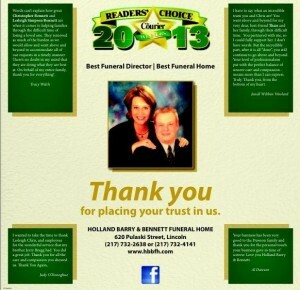 Holland Barry & Bennett Funeral Home, Lincoln is handling arrangements. Dana was born June 27, 1961 in St. Louis, MO., the daughter of Burton F. Herr Jr. and Patricia A. (Berry). She married Matthew Neale on February 2, 1990 in St. Louis, MO. Dana was a member of Park Meadows Baptist Church. She had a passion and a gift for working with children. Most recently, she worked at Building Block Daycare in Springfield. She enjoyed arts and crafts and was the secretary of the Music Boosters at Illini Central High School. Surviving is her mother Patricia Herr, husband Matthew Neale, daughter Alicia Ann Neale, siblings: Robyn Herr, Heather Herr, Sean Herr, and Jaime Herr; father in law and mother in law Robert and Marilyn Neale; brother in law Timothy Neale; and several nieces, nephews, cousins, and friends. She was preceded in death by her father and nephew Joshua Daniel Herr. Memorial donations may be made to Breast Cancer Research.